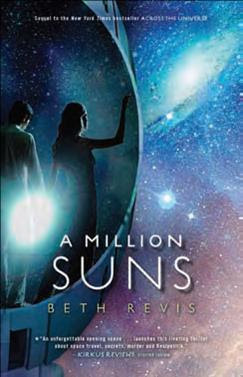 A Million Suns [Book Review] – my books. my life. NOTE: This review is free of A Million Suns spoilers, but assumes you’ve read Across the Universe. Three months has passed since Amy woke up on Godspeed. She is lonely, restless, and misses her parents, who remain frozen below. Elder is finding his new role as leader to be time-consuming and demanding. When they discover that there is more behind the story of Godspeed’s journey, they once again must find the truth in the lies and make a very important decision which will affect everyone aboard the ship. I enjoyed A Million Suns just as much as Across the Universe. Revis makes you think the world exists one way, then topples everything she previously established to show that it really exists another way. But since she keeps doing it, you are on the edge of your seat waiting to see what is REALLY happening here. The character studies are quite interesting given the extreme circumstances both Elder and Amy have been thrown into. Elder dealing with being Eldest. Amy dealing with an extreme form of loneliness. And the minor characters reacting very differently to their newfound freedom. I love these books. I can’t wait for Shades of Earth. I love this series too! Waaaay more than I thought I would. I met Beth Revis at RT last spring and she is awesome in person. I can’t wait for Shades of Earth either! I have both of these books, and I need to make some time to read them. They sound like they are really well done and that the characterization is executed brilliantly. I am glad that this one didn’t disappoint you. Great job with this review today, Michelle!